Friends, I come to you with a heavy heart, for I am at a loss. For years, I have been a fan of the local automaker, Porsche. Its vehicles have been classic, tasteful and, most importantly, owned and driven by people like me. I currently own quite a few. It was only a matter of time before the quaint carmaker extended its reach into the world of yachting. It’s a very natural progression, you see. So, this is what design house Studio F.A. 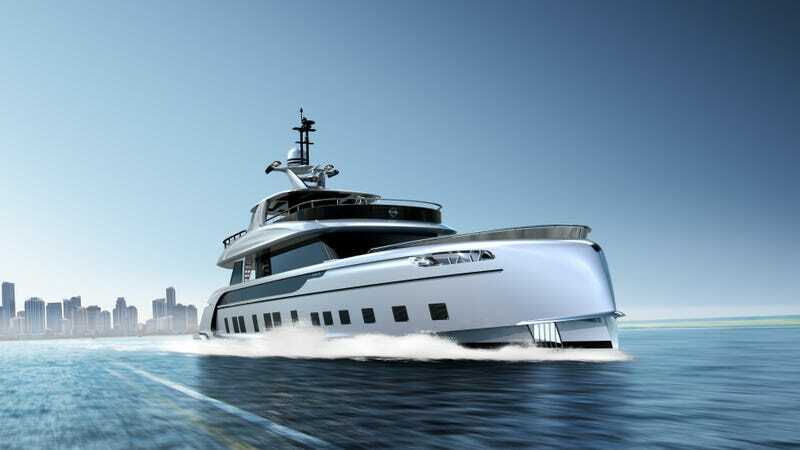 Porsche and superyacht builder Dynamiq teamed up to create: the GTT 115 Hybrid. I got the press release today and opened it, expecting to feel love at first sight. But I didn’t. Not even close. It wasn’t the “twin 1213kW MAN engines paired with the latest Fortjes 5000 pods” or the hybrid power system from the “twin 45kW Fischer Panda variable-speed generators located in the bow.” It wasn’t the deck cushions upholstered with a 911 R-esque houndstooth design (I have three!). Nor was it the nearly 115-foot length or its high, seven-foot plus ceilings (even on the lower decks!) It wasn’t even the exclusivity—only seven of these things would be made. No, none of those were the problem. It was the price: €11.9 million, or about $13 million. Thirteen million dollars only equated to about 15 Porsche 918 Spyders. I myself owned 20 already. What else was I supposed to ride in when the sedan carriers were all out with malaria? Plus, I needed all of the different color combinations. You know Porsche options lists. Thirteen million dollars meant that commoners like... venture capitalists and tech CEOS could now, ostensibly, buy their way into the exclusive superyacht circle. That was unacceptable. The only purpose for a price tag is to determine which breed of the clientele is fitting enough peruse the merchandise. And to keep the rest of the riffraff out. “It’s me,” I murmured into the phone. An affirmative grunt sounded from the other end. I paused while they responded. From the outside, it seems easy being me. But keeping the yachting community clean and clear of low-class poverty-stricken wards of the state is nearly a full-time job. And it’s a job I take very seriously.